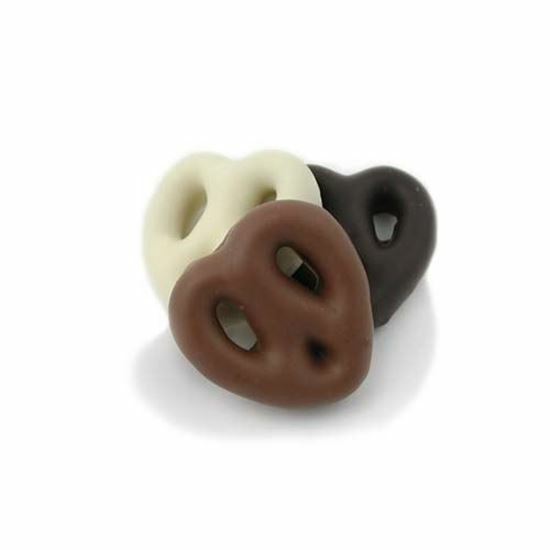 Mini Gourmet Chocolate Pretzels. Chocolate Store, the online candy store with chocolate and candy. Our pretzels are baked in stone hearth ovens, following the finest tradition of the old time Pennsylvania Dutch pretzel bakers. We then enrobe them in a thick coating of milk, dark, or white chocolate. Making the the perfect taste tempting treat for pretzel lovers of all ages. (Net Wt 1 lb. About 45 to 52 pieces per pound) Each pretzel is about 1.5 inches in size.